In 1997, Judy Stone published Eye on the World, which is just about the most astonishing collection of interviews with filmmakers ever assembled. It contained dozens of directors from all over the world, ranging from household names (Fellini, Woody Allen, George Lucas, etc.) to unknown European filmmakers making their debuts. At around the same time, Stone retired from her staff job as film critic with the San Francisco Chronicle. 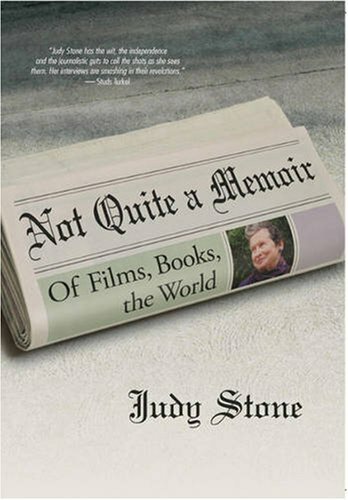 The new collection, Not Quite a Memoir: Of Films, Books, the World (Silman-James) may sound like a bunch of outtakes, but rather, as the title suggests, it comes quite a bit closer to capturing Stone's personality, her passions and her voice. Not Quite a Memoir has more writers interspersed throughout its pages: E.L. Doctorow, Thomas Keneally, Meyer Levin, Geling Yan, Maya Angelou, Jean Genet, Isabelle Allende, Hanif Kureishi, Diane Johnson, Michael Tolkin and many others, from many countries, each full of wise things to say about politics, religion or philosophy. But Stone is not particularly interested in big names, more in experiences and knowledge. So she turns her interviewer's notepad toward not just Kiarostami, but to every Iranian director she can get her hands on. There's Mohsen Makhmalbaf's daughter, Samira, who made her feature debut at age 19; Oscar-nominated Majid Majidi; Kurdish director Bahman Ghobadi; Bahman Farmanara, who waited two decades before getting a a script approved; and Tamineh Milani, who was arrested over the subversive content of one of her films. In fact, Not Quite a Memoir is probably the printed equivalent of one of those late-night pub conversations in which the world's great thinkers get together and come up with viable solutions for all the world's problems.